This year’s South by Southwest festival proved to be a success for Kandy Kruisers, the business started in the first class of RED Labs, the University of Houston startup accelerator housed in Bauer College. 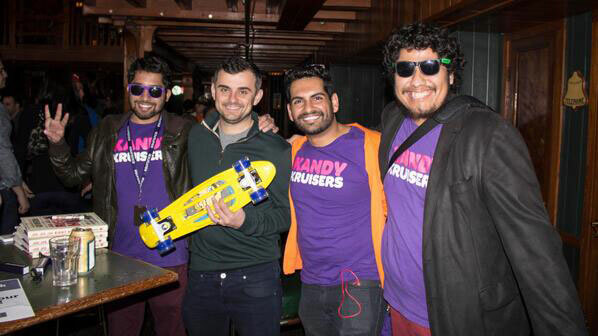 Co-founders, from left, Hamza Amir, Timur Daudpota and Jesus Hernandez recently won $10,000 during the SXSW Dumbstruck Challenge competition, hosted by VaynerMedia CEO Gary Vaynerchuck (center). Three students from the first class of RED Labs at the C. T. Bauer College of Business at the University of Houston recently won $10,000 competing against several dozen startups from across the nation at the South by Southwest (SXSW) Dumbstruck Challenge. Kandy Kruisers, a skateboard manufacturing company, was co-founded by entrepreneurship and supply chain management student Timur Daudpota and supply chain management student Hamza Amir with computer science alumnus Jesus Hernandez. The company’s signature product is a portable mini cruiser skateboard. After solidifying their business plan in RED Labs, the students have since grown Kandy Kruisers by signing on three of the nation’s largest skateboard distribution companies to sell their products. The $10,000 prize is vital to expanding the business, Daudpota said. The Kandy Kruiser group earned the big win at SXSW through a competition sponsored by Dumbstruck, a social video app for iPhone that launched at the music, film and technology festival, with support from partners Angel Hack, Momentum, Gunnar Optiks, Buzzstarter and VaynerMedia CEO Gary Vaynerchuck. The competition asked participants to “find the wildest action in Austin” and capture it using Dumbstruck, which allows users to see friends’ reactions to messages through video. The Bauer team incorporated their Kandy Kruiser boards and many celebrities in Austin attending the festival in their submission. The team said they envision Kandy Kruisers as an international lifestyle brand and will work to expand across Europe and Australia by next year, along with plans to get their products into large retail stores. Congratulations to Hamza, Timur, and Jesus. It’s great to see fellow students accomplishing great things and living out their dreams! Remember this startup pitch from June of last year? You’ve come a long way since!